What is Satya Nadella's strategy for Microsoft? 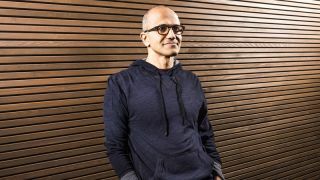 New Microsoft CEO Satya Nadella doesn't sound like he's backing down on the Microsoft 'devices and services' mantra, and we don't think he's going to satisfy the activist shareholders by selling off Xbox or Bing (which he used to run). As he said when his new job was announced; "our job is to ensure that Microsoft thrives in a mobile and cloud-first world." In fact, One Microsoft is the way Nadella has been thinking about Microsoft for a long time. He's has been articulating the principles behind One Microsoft since before it was even announced; that devices and services and all the different products Microsoft produces have to be interconnected and built to make sense together from the get go rather than being connected up afterwards. At Build last year he summed up why Microsoft is in the devices and services business by pointing out that they're interconnected. "We're well and truly into the world of devices and services;there is not a device or a sensor that is not connected back to a cloud service." Speaking at the launch of Windows Server 2012 R2 (and all its related services) last year, he was clearly enthusiastic. "This one Microsoft reorg is fantastic in not having any of these notions of who controls what." And he put that into practice (and showed a very CEO-like grasp of how Microsoft fits together) at the Financial Analysts Meeting last year. He also wanted to emphasise that Dynamics is a great way of selling Microsoft infrastructure products when Dynamics head Kirill Tatarinov was asked about profits. If you were wondering who might be the new CEO, that performance put Nadella firmly on your radar. It's easy to look at Nadella's past remarks and see him as purely an enterprise leader who might minimise Microsoft's consumer or device businesses. But that's mostly because as head of the enterprise services business, Nadella's been talking about his own products; when he said at the Financial Analysts Meeting in 2011 "our mission is to cloud optimise every business," that doesn't mean he thinks Microsoft should only be in enterprise cloud. In fact even for cloud, he's always said the strength of Azure is how many workloads it runs. "What makes the [Microsoft] services we run so useful, from Xbox to Bing to Skype, is diversity. I keeps us honest, keeps us from getting hijacked by just one architecture pattern. Having worked on Bing, I know you can optimise for just one architecture pattern – but patterns are diverse and they change from industry to industry." In fact, the point of One Microsoft is very much that it's increasingly one market. "Categories are going to rapidly shift; what is a developer product, what is an IT product, what Is an end user product – they all have to be rethought. We think about this as one unified engineering effort and one unified go to market effort. And especially with consumerisation that becomes even more important." That sounds like a vote of confidence in Surface and Windows Phone and Bing and Office and Xbox and the breadth of Microsoft products to us. It's also unlikely that Bill Gates transitioning from chairman of the board to founder and technology advisor signals less of a position for him at Microsoft or less influence on the new CEO.